Both of the acts have a section called “The referendum” that gives details about what question would be asked and how the referendums would be carried out. 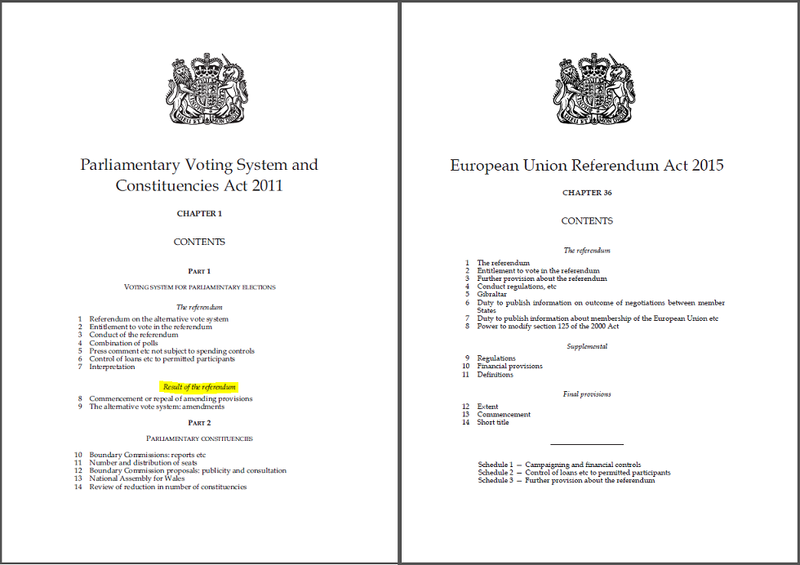 In addition, the laws covering the Alternative Votes referendum have a section called “Results of the referendum” (highlighted) which says how the laws would be changed if the majority of the voter choose “Yes”, but there is no similar section in the EU Referendum Act. The Parliamentary Voting System and Constituencies Act says “There will be a referendum on Alternative Votes, and if the majority say “Yes” then this is how Alternative Votes will become law”, but the European Union Referendum Act just says “There will be a referendum on membership of the EU” and it says nothing at all about what happens after the referendum. So when a majority chose “Leave” all that actually happened was a message was sent to parliament saying “52% of the voters chose leave, deal with it.” There was nothing in place to handle the situation we found ourselves in, and since then our politicians have been having to make everything up as they go along. This doesn’t mean that the UK won’t leave the EU, but the referendum alone wasn’t enough to guarantee that we will leave, and it didn’t even try to decide how we would go about leaving. To get an idea of the type of situation we are in imagine a group of friends who decide to go on a day out, they go to a busy railway station and when they get to the front of the queue they realise that they haven’t actually agreed where to go. So they stand at the front of a queue of increasingly impatient travellers and start bickering: some saying that they just want to go a couple of stops, do a bit of shopping and be back home in time for tea; some saying that a day out means going intercity to the seaside; some wishing that everyone would just stop arguing a buy a ticket; and some hoping that everyone gives up and abandons the idea of a day out. As I write there is a great deal of arguing about what should be done in the light of the EU referendum result. There are a lot of people crying “Foul” but no-one is breaking the law or attempting a coup, everyone is playing by the rules. This will get sorted out in the end, it may get messier, and in the meantime some of the other members of the EU will get aggravated with us for bringing this uncertainty into their lives, but it will get sorted out. What we are seeing now is not a failure of democracy, it is extraordinary actions being taken within our political and legal framework in response to an extraordinary situation.